Emerging markets have been one of the hottest trades of the year thus far. The iShares MSCI Emerging Markets exchange-traded fund (EEM) is up 7.6 percent. EEM fell 17.1 percent last year and was in bear-market territory, trading 20 percent from its 52-week high. "This is one of the best times to diversify into emerging markets," said Luca Paolini, chief strategist at Pictet Asset Management. "Everything is pointing to outperformance in emerging markets." Brazilian stocks are up sharply this year. 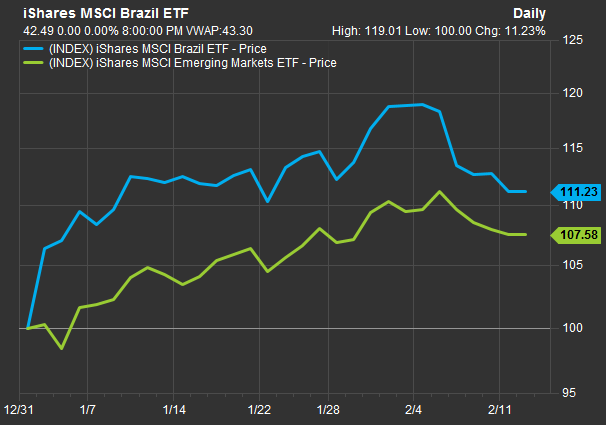 The Bovespa index, Brazils benchmark index, hit an all-time high recently and the iShares MSCI Brazil ETF (EWZ) is up more than 10 percent in 2019. Brazilian stocks are also outperforming the broader EEM fund this year. Investors around the world have been cheering Brazilian stocks on hopes the new administration can pass push through major changes to the countrys pension system this year. Brazils generous pension system makes it so most working citizens can retire in their 50s. This led to massive debt levels in Brazil and contributed to the countrys recent economic troubles. Newly elected President Jair Bolsonaro signaled last month the minimum retirement age for men and women could be raised to 62 and 57, respectively. This would be a weaker proposal than the one raised by former President Michel Temer, which would have hiked the retirement age to 65 for men and 62 for women. The average retirement age in Brazil is around 55 years old. "Confidence levels have increased steadily since October, backed by the governments liberal agenda," Larry Brainard, chief economist for the EM team at TS Lombard, wrote in a note. "The confidence boost is crucial to sustain the rebound but it must be followed by concrete progress on reforms. Longer-term, sustainable growth is possible only if structural reforms are made." "Mexican bonds are under-loved and pricing in the worst-case scenario," said Amr Abdel Khalek, emerging markets strategist at MRB Partners. "We dont see peso bonds as the strongest outperformer in a universe of EM local-currency denominated bonds, but the combination of peso undervaluation and the relatively rich yields mean that they can outperform the benchmark on a 6-12 month basis." Investors are fretting over some of President Andres Manuel Lopez Obradors fiscal measures, including pulling the plug on a partially built $13 new airport in Mexico City. Lopez Obrador, better known by his initials AMLO, also said last week he would announce measures supportive of Pemex, a giant state-run oil company. AMLO did not provide specifics in his comments from last Tuesday, however, leaving investors worried about how sweeping his proposals could actually be. AMLOs comments came after ratings agency Fitch cut Pemexs rating to BBB-, the lowest investment-grade rating, from BBB+. Still, Pictet Asset Managements Paolini thinks Mexican bonds remain attractive given their valuations. "If youre looking at Mexican bonds, unless youre expecting something bad happening on the political front, there is some real value there." One of the most attractive sectors within emerging markets is banks, according to UBS. UBS reiterated its overweight rating on emerging-market banks last month, noting external risks like the U.S.-China trade war and tighter monetary policy from the Fed are "beginning to recede." U.S. and Chinese officials are trying to strike a deal on trade before an early March deadline. If a deal is not reached by then, additional tariffs on Chinese goods will take effect. At the same time, the Fed signaled at its most-recent meeting it will be patient tightening policy, bringing down expectations of future rate hikes. According to the CME Groups FedWatch tool, there are currently no rate hikes priced in for 2019. This, along with improving fundamentals, should boost emerging-market banks, said Philip Finch, global banks strategist at UBS. "We currently forecast loan growth at 10.5% in 2019, up marginally from 10.2% in 2018 with [net-interest margin] expanding slightly to 3.06% from 3.03%," Finch wrote in a note Jan. 18, adding he expects EM bank earnings to grow by 13.7 percent this year and loan growth to reach double digits. UBS also seven banks in its Top 40 EM stocks list, including Banco do Brasil, OTP Bank in Hungary, Perus Creditcorp and Hong Kongs China Construction Bank. —CNBCs Michael Bloom and Reuters contributed to this report.